The New Living Translation says Psalm 91:1 this way... Those who live in the shelter of the Most High will find rest in the shadow of the Almighty. (NLT) For anyone who struggles with fear, I would recommend reading Psalm 91 over and over again. It is a psalm that will bring reassurance to a troubled heart. Today's promise speaks of a resting place in the heart of God that every believer has access to 24 hours a day, 7 days a week, 365 days a year. 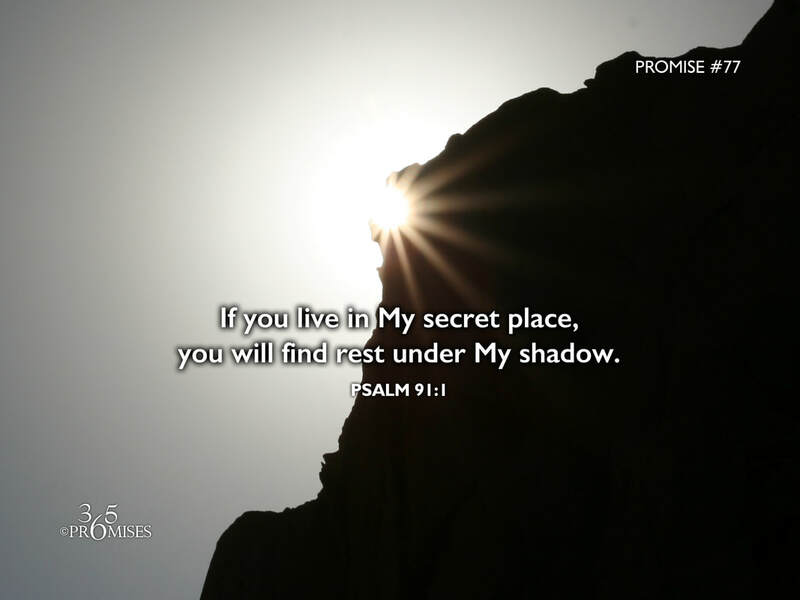 It is called the secret place of the most High, the shadow of the Almighty. In this place, we are completely safe and secure. Nothing can harm us there! What a picture of God's protection and His care! Verse 4 goes on to say that our God will cover us with His feathers and provide shelter for us under His wings. When I think of this picture, I imagine a mother eagle hovering over her little eaglets, sheltering them in their nest from anything that would bring them harm or make them feel distressed. My prayer today is that each and every one of us would find the secret place of the living God and make our home there all the days of our lives. Can you imagine what life could look like if we could live there every minute of every day? I believe that this is not a physical location, but rather a posture of our heart. May each one of us enjoy all the tangible benefits of living in the shadow of our Heavenly Dad right now.